Shown above is a Printable Map of USA state borders. The United States map shown here is only a representation. For a wide assortment of free printable maps of America, visit any of the links shown on this page. One map shows all areas equally scaled to create the most accurate representation of the locations, sizes and border lines of all fifty US states. The United States maps available here show cities, landmarks and major roadways, as well as topographical features like mountains and water bodies. Also provided is a collection of useful information and interesting facts about each state depicted on the map. To use the maps and other free printable items featured here, simply right click on the image(s) of your choice and select a SAVE option from your drop down menu, to send the image to your picture file. From there you can adjust the page margins and reduce or enlarge the image as needed for best printed results. Print as many copies as you like for your own personal use. For other printable state map designs, visit the links below. The USA contains fifty states, as well as a few terrirories, districts, and other land masses not normally referred to as states. When measured from east to west, the state of Alaska is as wide as the entire mainland USA. The Pine Ridge Indian Reservation in South Dakota is about the same size in square miles as the state of Connecticut. Most US land maps are POLITICAL maps designating states, counties, cities and other man-made distinctions. and TOPOGRAPHICAL maps (showing elevations, water bodies and other natural features of the terrain). Go Here for a colorful, clickable USA Map Quiz. 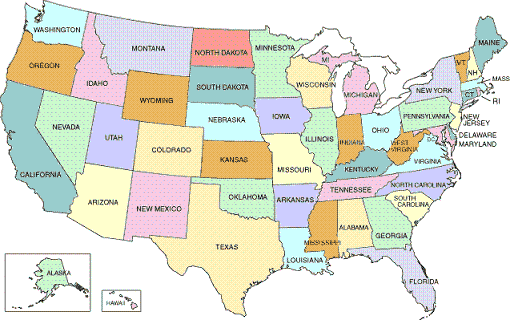 See this page for a Printable USA Map Quiz. Go here for More Free Printable Maps.